The term “paste” is used to describe various different types of cut glass. Paste stones come in an array of colours and sizes and they were mainly produced to imitate the look of diamonds. Today, we consider paste stones as little more than costume jewellery or imitation stones; however paste was extremely popular during the 18th century. The most commonly used material for paste was lead glass. Due to the high refractive index and dispersion rate of this material, these dense stones had a certain life and sparkle when cut and polished. Paste stones could also be backed by different foils and colours in order to imitate the effect of natural stones. Alsatian jeweller Georg Friedrich Strass was the initial inventor of imitation gemstones. 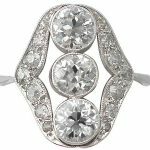 He dedicated his practice to the development of “imitation diamonds” and was perhaps most famous for the invention of the Rhinestone (a crystal found in the river Rhine). He was also given the title the “King’s Jeweler” in 1734 by King Louis XV of France. 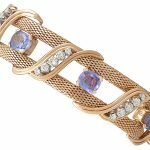 The value of paste jewellery is relatively low in monetary terms in comparison to natural diamonds and gemstones. 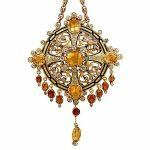 Despite this, paste diamonds used in antique jewellery should not be regarded as mere imitations; they were an art form in their own right and have received extreme popularity within aristocratic circles, particularly during the Georgian period. 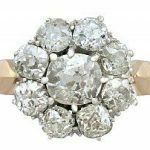 Paste stones are unfortunately much softer than most other materials and usual wear and tear has meant that many items of antique paste jewellery have not survived the test of time. It is quite rare to find earlier Georgian pieces in good wearable condition. 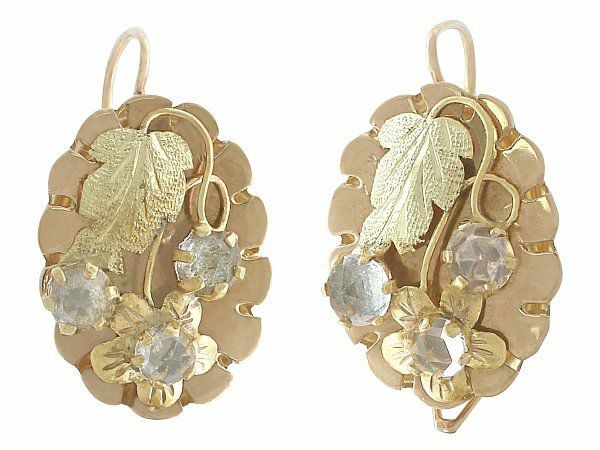 Paste jewellery is rich in history and character; it can also be a good indication the piece is a genuine antique. Using paste can create a stunning look for a mere fraction of the price- so we can definitely see the benefits! 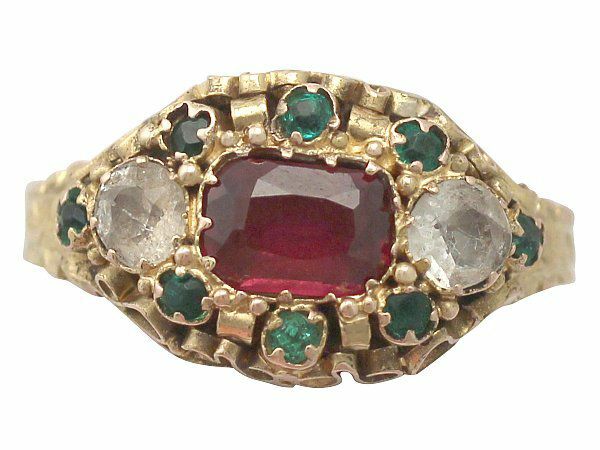 A good example is this fine and impressive antique white, green and red paste, 15 carat yellow gold Victorian dress ring we have in our inventory. During the Victorian Era, non-precious pastes were a part of evening jewellery sets. They were also used in pieces intended to convey coded messages of romance, based on the colours of the pastes. Such crystals, which were made of high-lead-content glass and had a permanent foil backing, gave the illusion of almost any gemstone, including diamonds, rubies, sapphires, emeralds and amethysts. 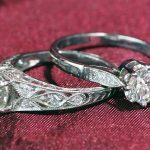 How can you tell the difference between paste stones and genuine diamonds? To the trained eye it is very easy to differentiate paste stones from diamonds. Of course, not everyone deals with these stones on a daily basis, so what should you look out for? Paste stones are neither as hard nor tough as diamonds; this means that you will see a lot more wear and tear. Things to look out for include: scratches on the surface or the facets, chipped facet edges, and round facet edges. Diamonds are the hardest mineral, meaning few materials should be able to scratch the surface (apart from of course, other diamonds). The facets will be sharper with less wear on genuine diamonds. If there is any visible damage to a diamond however, it would usually appear as a much smaller “nibble” to the facet edges. Allow the light to reflect off the surface of the stone. Diamonds have a mirror like adamantine lustre which is one of the reasons they are so loved. Paste however, only has a glass vitreous lustre; it won’t have as strong an impact as the reflection from a diamond. However, lead glass “paste” diamonds have a high dispersion value, caused by their high reflective index. This is one of the main reasons they were used to imitate diamonds. Because of this, although they are glass “paste” stones they can still show brilliance, just like the glass shards of a chandelier. Previous Entry: What is a Carat?